Which exit did we get off, again? Well, maybe we’ve been too hard on the Democrats here at LIKELIHOOD OF CONFUSION®. Perhaps unlike the GOP, they’ve got good, progressive IP counsel out there, and maybe an Obama Administration will take a more realistic view of what you can and can’t do on the Internet. 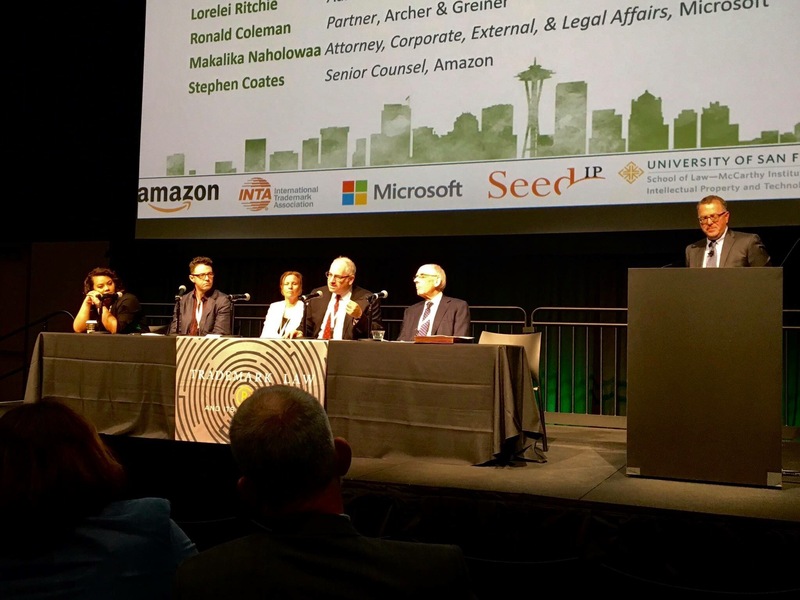 At least we know they don’t have any hangups about “deceptive key word advertising” or “Internet traffic diversion,” the modern bugaboos of Internet trademark litigation. Turns out they think those things are pretty keen! The link actually tells Internet users they’re going to a page called DemCovention.com/RNC. 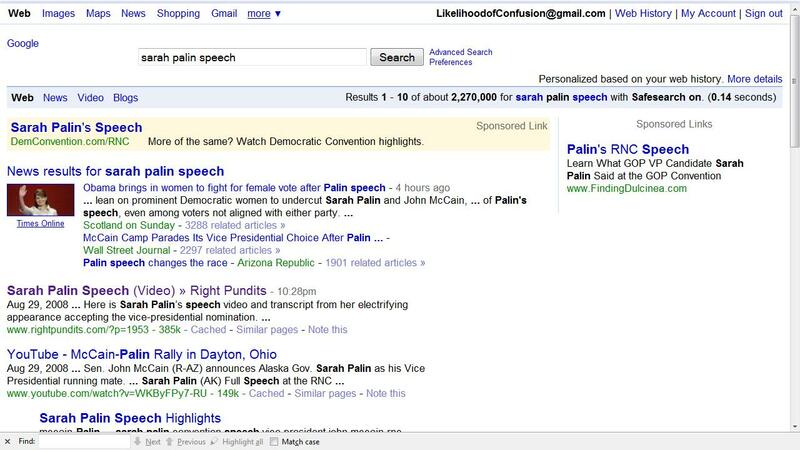 Wow, are they showing the Palin speech in order to get you to compare it critically to what the DNC has to offer? It’s comparison shopping, right? A modern-day Miracle on 34th Street! Yeah, no Sarah Palin. At all. (Here‘s the whole page.) You’d think they were afraid of her or something! You know, I’d heard about that young Palin woman and her fine speech, but having clicked this link and now looking at this somewhat older fellow with the spray-on hair, why, I think I like what I hear! Maybe, but you must agree with what we have argued at LIKELIHOOD OF CONFUSION® (and in a courtroom or two) for years: This is not a deceptive trade practice, it’s free speech and consumer choice! Wait — even when there’s “no Sarah Palin” at all at the link?! Well, actually… look: No one is going to confuse Sarah Palin with Joseph Biden. And trademarks, after all, are about one thing only: LIKELIHOOD OF CONFUSION. So no problem. In any case, SARAH PALIN SPEECH isn’t a trademark, so analogies to the old “it’s like tricking people to get off the highway using a phony sign” rationale for “initial interest confusion” in trademark law go only so far. Not actionable, in other words. And as far as ethics go — well, you know, politics, bedfellows, The Prince, all that sort of thing. This is a change, right? 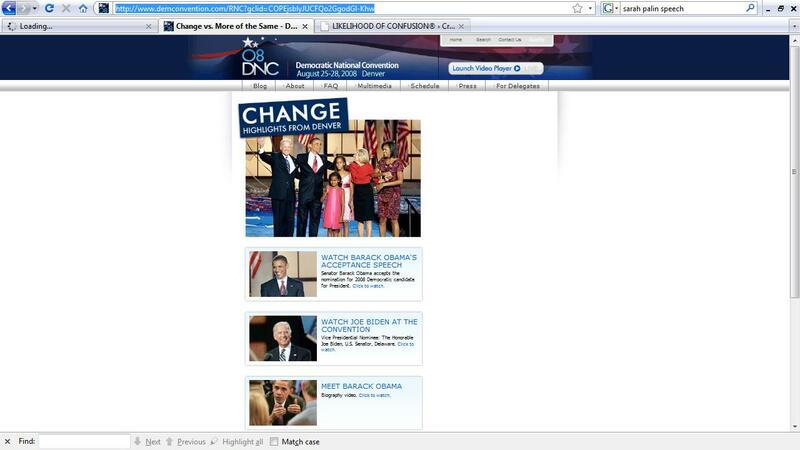 UPDATE: Speaking of change — picking up the traffic, obviously, the DNC has removed the ad. Hilarious sarcasm, Ron. For a Republican to be criticising a Democratic Party advertisement on ethical grounds! How funny! Oh, you’re just mad because the RNC didn’t think of it first. You have to admit, that’s a lot more subtle than plain ol’ domain-squatting. And you’ll note the “extensive vetting process” didn’t include trying to grab the sarahpalin domain names, which would have been one of the FIRST things I would have done. Somebody over at the RNC needs to get up to speed on the Intartubes! Note: the above comment is in the spirit of obnoxious humor, not partisanship. I do not support either major party. Marc, I’m neither mad nor angry. Just laying it all out. And you’re not even close to being obnoxious — see the previous comment. Now, that’s close. This seems like quite a problem for google. Certainly this will diminish the value of their product. There are quite a few other browsers as well as effective ad-blockers. I would like to know how to voice my complaint about this to google but it is very difficult to find a contact method. Lee Atwater must be spinning in his grave. Imagine, the Dems using dirty tricks! I guess his patent on the dirty trick must have expired. Hey, Ron. Care to comment on the latest from a washed up 80’s legend? Apparently, Heart is complaining about the RNC using ‘Barracuda’ after the Palin speech. It would be nice to see someone with some credo put the hammer down on the whole thing. Very Interesting! Last Friday morning, after McCain announced Palin as his VP running mate, I tried to get online to volunteer to help. In Houston, if you enter John McCain for President in Houston, you get Barrack Obama for President…no John McCain, no McCain…I could never find the McCain head quarters. No problem…dirty tricks never work…the American people are smart. I have since found it and plan to work to get them elected. At least now I know that it was not me.